Are you having trouble turning your subscribers into customers? Your job isn’t finished once you’ve gotten someone’s email address; in fact, your job is only beginning. In this article you’ll learn the email marketing mistakes bloggers, marketers and even experts make that kill their email conversions, and how you can correct them. Ready? Let’s dive right in. Congratulations! Someone just subscribed to your email list. …Now, what are you going to do? If your answer isn’t “immediately send them a welcome email,” you’re missing a golden opportunity. By far, your most read email will be the first email you send to your subscribers. Why? Because it’s sent when readers are most engaged with you. They just subscribed. You’re fresh in their minds. They remember you. So as soon as someone signs up for your email campaign, they should receive an email that explains who you are and what they can expect from you. Welcome them to your email list. Introduce yourself. Tell them what’s ahead. Your welcome email sets the tone for all emails to follow; as such, it plays a vital role in future conversions. If you know how to write a welcome email that does these 3 things, your email campaign will be off to a great start. 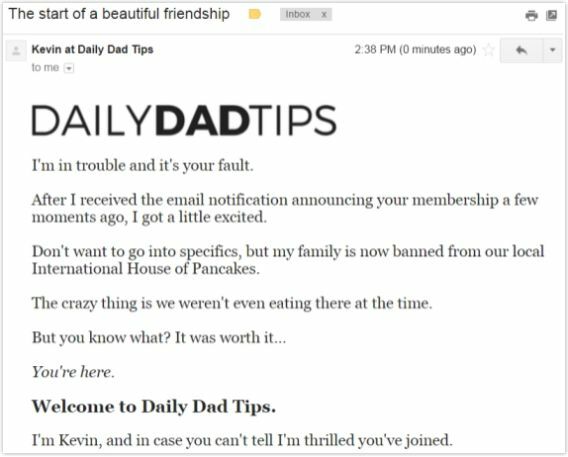 For more inspiration, check out these welcome email examples that build trust with subscribers. As you’ve undoubtedly read a time or two or ten, your content needs a call to action (CTA). This is true whether you’re talking about a landing page, a blog post, or an email. Without a call to action, you’re leaving it up to your audience to figure out what you want them to do. Your readers are undoubtedly smart, but this is asking too much of them. So before you compose your email, start with a clear vision of its purpose in mind. Do you want to promote a piece of content you’ve written? Do you want to inform the reader of an upcoming launch or event? Do you want to make a sale? Focus your email’s text, images, and design to guide your readers toward this outcome. Then, before you send the email, make sure your call to action is clear, enticing, and points the reader towards the outcome you hope to achieve. Don’t bury your call to action in your email. Use bright colors, bold text, or large buttons. Display it prominently so that it stands out from the rest of your email. Words matter. If your CTA is boring or vague, readers may skip right over it. Use action words like “read more” or “buy now”. Use urgency. Foster curiosity. Like so many things in life, there can be too much of a good thing. If you have multiple calls to action in a single email, your message can easily become muddled. Instead of taking the action you wanted them to take, readers will take no action at all. When it’s appropriate, repeat your call to action more than once. You’re trying to make it as easy as possible for your reader to go straight from the email to your website or product. Repeating the call to action multiple times allows your reader more opportunities to notice and interact with it. If your emails aren’t meeting your readers’ expectations, they are going to unsubscribe from your email list. And if that happens, the best email copy in the world won’t matter. Your brilliant words, your amazing product, and your compelling CTAs will no longer be seen because your emails will no longer be delivered to inboxes. So how can you fail to meet readers’ expectations? One way is email frequency. If you promised to email weekly, but you’re emailing your audience daily, you’re not meeting your readers’ expectations. On the other hand, you’re not meeting expectations if readers expected to hear from you frequently but you only email once in a blue moon. Another way you can fail to meet the expectations of your audience is by going off topic. If your readers were expecting weight loss tips when they subscribed, send them emails related to weight loss. If they were expecting blogging tips, give them blogging tips. Your trip to Omaha, Nebraska, as enthralling as it may have been, isn’t going to interest your readers. One of the great benefits of email is being able to touch base regularly with your customers and keep your brand on their minds. But don’t go crazy. Go too far off topic, or off-topic too frequently, and readers are going to leave you. The web is a sketchy place, so your readers are rightfully skeptical of new websites and emails until they’re proven safe and professional. If your emails look sketchy or amateurish, most readers won’t be willing to give you the benefit of the doubt. Conversions? You’ll be fortunate if you can keep them as subscribers. Nothing will kill a conversion quite like a “Byu Now” call to action. Proofread every email before you send it out. You’re better off not having an image at all than having a stock image readers have seen a dozen times elsewhere. Here are some great places to get images for your marketing. Professional marketers don’t include attachments in their emails. Know who tends to use them, though? Spammers and scammers. Unless your attachment is a PDF the reader specifically signed up to receive, don’t include attachments in your marketing emails. And even then, it’s best to provide a link to your PDF. Unless you’re marketing specifically to sailors, it’s best not to curse like a sailor. It’s a very, very specific audience that will tolerate such language in email marketing. And odds are your audience isn’t it. Ever notice the similarities in the email subjects you receive in your inbox? They’re so similar, they all blend in together, don’t they? Use what you see to your advantage. Browse your inbox. What works on you? What sounds cheesy? While you might see your product, service, or content as being unique; your reader will likely see it as just another voice that gets lost in their inbox. Unless, of course, you make yours special. Here’s where many email marketers miss the mark: they sound like a TV commercial. Instead, write your messages like you’d write someone you know. Be a friend, not a salesperson. Instead of saying how great your product is, tell your reader what benefits they can reap from it. Make your sales focused on what value you can provide. Besides being inexplicable, these kind of headlines and titles are a dime a dozen these days. Your emails will stand out less if their subject lines follow this tired formula. Instead, write purposeful subjects. Your readers will appreciate it, and your conversions will increase. Want a sure-fire way to send your email conversion rates way down? Up to 70% of your readers will be reading your email on their mobile device. If you’re not ensuring your audience can read your emails on their phones or tablets, you’re making a very expensive mistake. Formatting for mobile devices should be simple and clean, with images and text that are easily readable on a small screen. You have limited real estate, and you don’t want to make your reader do any more work than is necessary. Keep content to a single column, and use images that are no wider than 600 pixels. Don’t fly blind! Test your emails on mobile apps to ensure that they’re coming across the way that you want them to. If you’re working with a small team or simply don’t have the hours or experience to create mobile-optimized emails, there are services that can do this for you. However you do it, don’t skip it, because it could make or break your email campaign. In each example, the text is a nice, readable size; the images are clear, and the white space is generous. 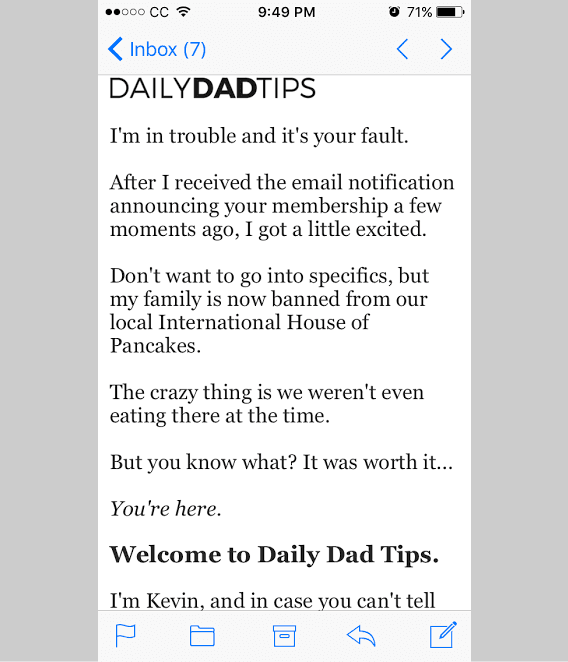 These are mobile-friendly emails built for conversions. Your first instinct may be to load up your emails with beautiful, eye-catching, professional pictures that will excite your readers. While this isn’t wrong in and of itself, it’s important to remember that many of your readers may view emails with images turned off. If you don’t have a plan B, you’re missing these clients altogether. This doesn’t mean that you shouldn’t use images at all. It just means that you need to be a little more careful with how you use them. If you judiciously employ proper alt text, your viewer will still be able to get a good idea of what your email is about even if the images don’t load. “Alt text” is text that will replace an image if the image fails to load or is blocked by the service. It’s placed by using the “alt=” tag inside HTML code for the image, but the best email marketing services will let you add alt text without the need to know HTML code. However, even if you’re using alt text, an email with a bunch of large empty boxes with a few lines of texts is not going to come across well to your readers. Go easy on images and make sure that all of the truly important messages come through somewhere in plain text, so your readers won’t miss them. 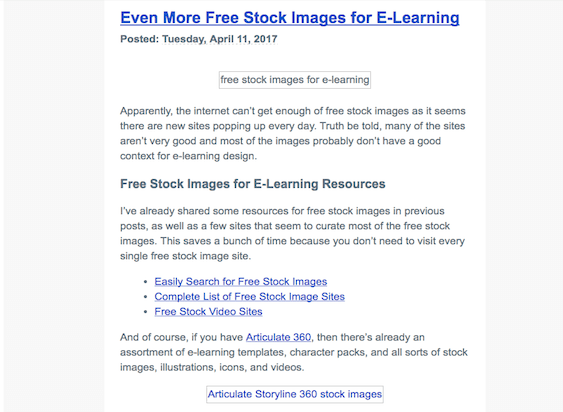 This email from The Rapid E-Learning Blog has great alt text for the pictures that didn’t appear here, as well as a great balance of text vs. pictures. 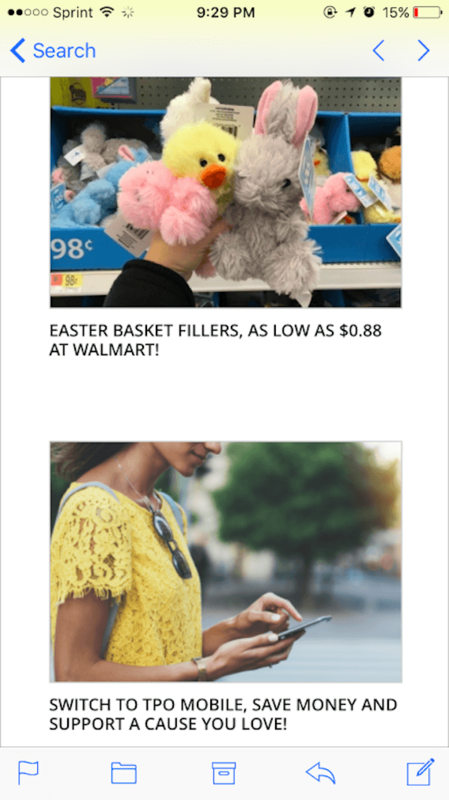 Even though the images in this example don’t display, the reader can still see the key messages in the email. 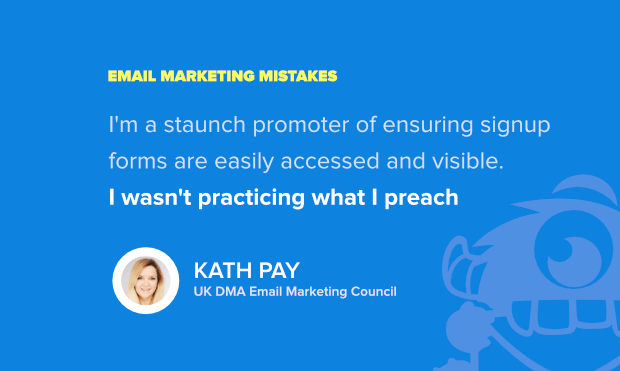 Kath Pay: I run an email marketing consulting agency. Our bread and butter is in sharing our knowledge and experience of email marketing, holistically. Whilst we push for best practices for our clients, there was one thing that we settled for less-than-best with our own practice – email signup placement on our website. Due to limitations with our previous website platform and ESP, we were only able to have our newsletter form in the footer of our website. Even though this signup was a prominent part of our footer on every page, we suffered by seeing only infrequent signups, and it perpetually grated on me as I am a staunch promoter of ensuring signup forms are easily accessed and visible. I wasn’t practicing what I preached due to technical limitations – argh! So, when we went through the design stage of our new website last year we made sure to include a signup at the top of every page in an eye-catching box. By rectifying this mistake, we have seen our email signups jump dramatically in volume. 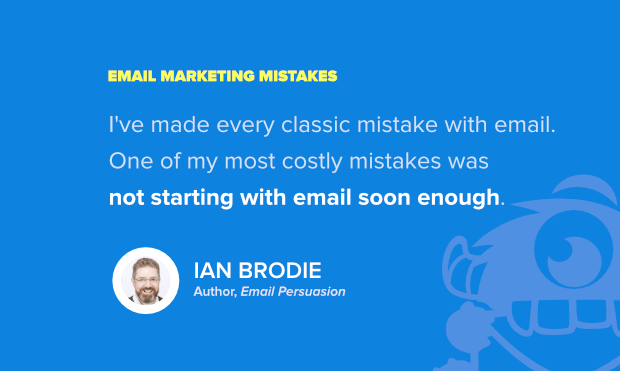 Ian Brodie: I’ve made pretty much every classic mistake with email. Sending out broken links, incorrect dates, wrong prices, badly formatted emails. I even sent out a private invite to a small group call for 10 people to 10,000 subscribers by mistake. I’ve had emails with fun stories in them using celebrities as examples – and failed to change the emails when the celebrities got embroiled in all sorts of scandal. And I’ve made the mistake of not monitoring my key emails closely enough and finding out days later that my most important “last day” email didn’t get sent out and as a result my sales took a huge hit. But probably my most costly mistake was simply not starting with email soon enough. For the first few years after starting my business I invested in SEO, in social, in content – but just felt that email was a bit old fashioned. It took one of my good friends to pull me up and tell me what an idiot I was being before I came to my senses. Ian Brodie helps consultants and coaches win more clients by becoming seen as authorities in their fields. He’s the author of the Amazon Best Seller “Email Persuasion” (with over 150 5* reviews worldwide). The purpose of every email in helping bring them to a point of meeting that need. Too often, I (or clients) would assume we needed “X” amount of emails, and we’d fill in the “purpose” but after the fact. Now, when I approach an email series, I carefully think through what each email is intended to do and plan out the series to correspond with how the audience reacts/does not react. Every email is engineered to bring them one step closer to their critical “AHA!” moment instead of serving the whims of the marketing team. 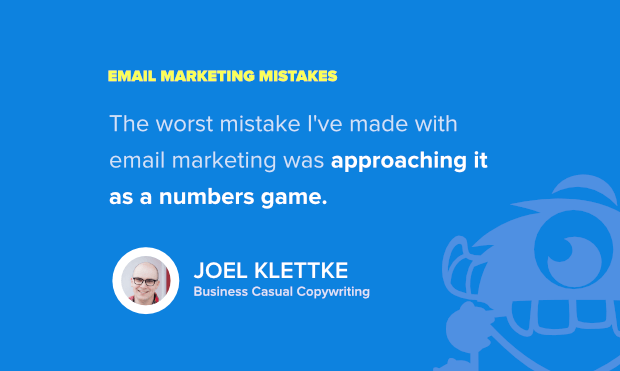 Joel Klettke is a conversion copywriter and CRO consultant at Business Casual Copywriting, where he’s helped clients like HubSpot, WP Engine and InsightSquared turn more visitors into paying customers. Follow him on Twitter as @joelklettke. Jordie van Rijn: Back in the days when I worked at an agency, we did a B2B campaign for an insurance company. It had a call-me-now button that sent an SMS to individual advisors in the field “call this and this person”. Worked like a charm; after the promotion, the campaign was archived. With an update of the ESP SAAS environment, however, all running campaigns were paused and later activated (without us knowing), including this archived campaign. The campaign had a single loop, that worked if someone went through the campaign once. But that, as we found out, didn’t account for a reactivation. Yikes! So the SMS function kept on looping, ending up sending hundreds of SMSes during the night. One advisor had his SMS box full, and the messages got switched over to his voicemail, which he then had to remove manually. Luckily, only the internal people were affected. Lesson learned: Make sure you add a “stop block” and disconnect the source from any automated campaign once you retire it. Rename the campaign accordingly when archiving and build in logic that accounts for unwanted looping. Only professional email marketing agencies and consultants learn these type of things (the hard way). If you have really professional help, they will own up to the mistake (and don’t blame the ESP or a “technical problem”). 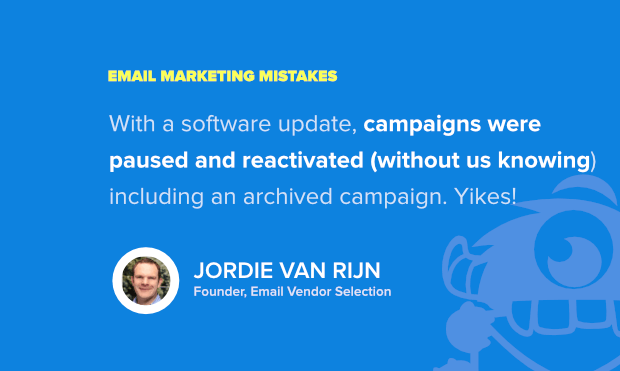 Jordie van Rijn is a thought leader in the email and marketing automation space, with over 13 years of experience. He is a consultant and online marketing speaker at emailmonday and founder of Email Vendor Selection. Jeff Cox: The worst mistake I’ve ever made with email marketing was putting off sending a new type of email campaign until I had “enough” subscribers signed up for this particular list. This mistake led to an unnecessary 3-month delay in the launch of our new newsletter, which ultimately came during the craziest time of the year. This meant I had a bunch of other priorities competing for time and my contacts’ inboxes were being flooded by other emails. 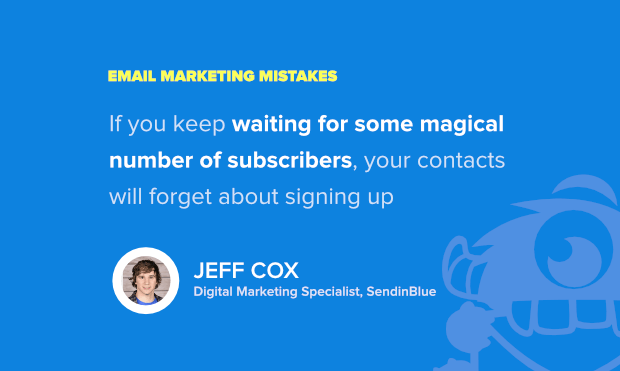 Of course, you want to have as big of an audience as possible, but if you keep waiting for some magical number of subscribers, your contacts will forget about signing up in the first place. This can lead to lower engagement when you do finally send out your emails because recipients won’t be expecting to hear from you. Instead, focus on following through with the commitment you’ve made to your current subscribers and give them what they’re looking for. Additionally, many email subscribers share insightful or interesting emails with their peers. By waiting to send out your emails, you’re limiting any list growth potential that comes through these types of referrals. That’s why you should start sending as soon as possible so you can learn what your audience likes and dislikes while continuing to grow your list naturally and keep your subscribers coming back for more. Jeff Cox is a digital marketing specialist in charge of US content at SendinBlue. You can find him on Twitter at @jeeff_cox. Joanna Wiebe: Listening to the haters and, in so doing, pulling back on sending important emails. When you’re running a promotion, you’ll often send as much as two emails a day over a short period (e.g., 5 days). Early on, one or two people would reply to my emails with something like, “Stop selling to me.” And I’d internalize that feedback in a really unhealthy way – I’d second guess every email from that point on. That’s bad for biz. So now I 1) don’t let the people who don’t understand my biz dictate how I grow it and 2) use segmentation to make sure I’m only sending the most relevant emails to the right people – whether that’s 2x a day or once a month. 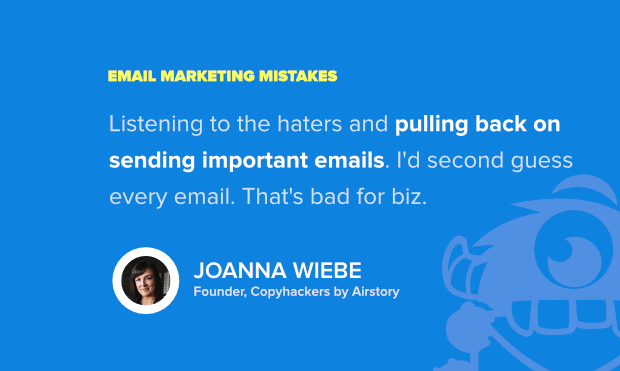 The original conversion copywriter, Joanna Wiebe is the founder of Copy Hackers by Airstory. She’s written conversion copy for brands like Wistia, Buffer and MetaLab, and she’s been invited to speak on 100+ international stages, including Mozcon and INBOUND. 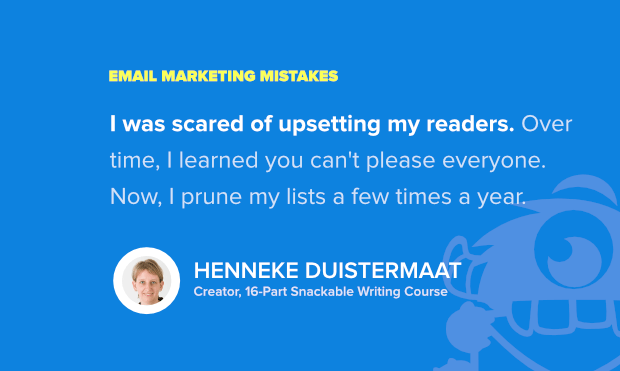 Henneke Duistermaat: I’ve probably made all the most common email mistakes. I’ve sent emails with typos (even in the subject line). I let my list go cold for a few months. I accidentally sent the same message twice to the same list. And once I even sent a welcome message to people who’d been on my list for years. But all those mistakes feel minor to having the wrong mindset. When I started my email list, I was scared of upsetting my readers and I was distraught when people unsubscribed. Did they hate my writing? Was I emailing too often? Was I too boring? Over time, I learned you can’t please everyone. The emails that bring you closer to your raving fans are the emails that turn off subscribers in the periphery. Now, I prune my lists a few times a year. Removing people who aren’t that interested in hearing from me feels like a good cleaning job. Plus, I’ve learned to write for my core fans only. It’s more fun for me, and more valuable for my subscribers, too. Henneke Duistermaat is an irreverent writer on a mission to stamp out gobbledygook. Her free 16-Part Snackable Writing Course is recommended by AWeber and others as an excellent example of an opt-in bonus. 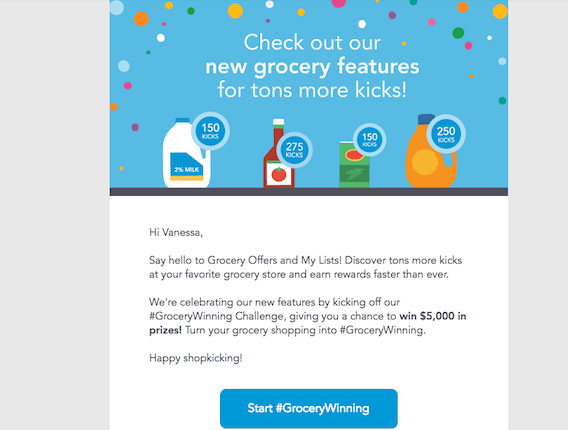 Ready to Increase Email Conversions? Conversions don’t stop simply because you already have someone’s email address. 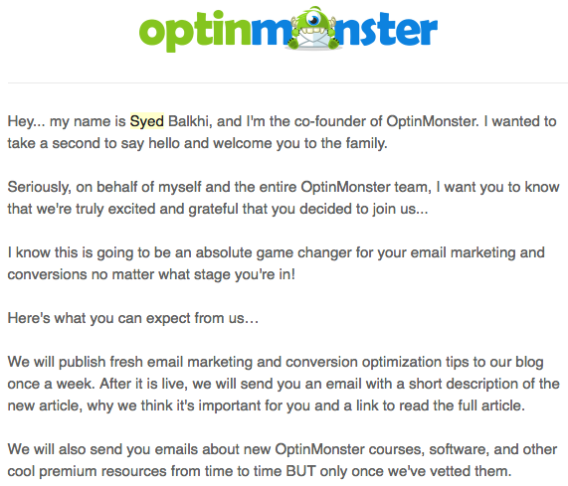 You now know 14 crucial mistakes bloggers, marketers, and even experts make in their email campaigns that kill conversions. Now you know the top email marketing mistakes they wish they hadn’t made, you’ll be able to avoid them in your own strategy. Next, check out our previous roundups on content marketing mistakes and nailing SEO for more expert advice. And follow us on Twitter and Facebook for more expert roundups and in-depth guides.